Heron holds a tenement package that extends 100km north and south of the Woodlawn Mine and covers prospective Silurian volcanic rocks that host the high-grade Woodlawn Volcanogenic Massive Sulphide (VMS) deposit. 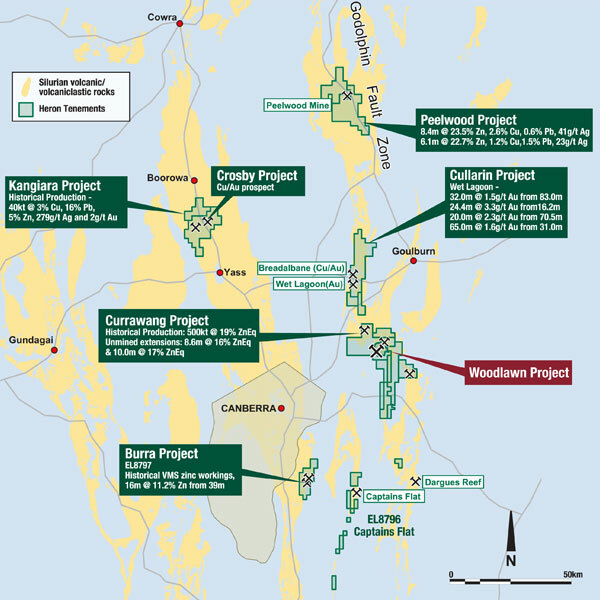 Exploration is focused on known mineralisation zones and targeting additions to the mine’s resource base. A large number of available targets provide for both extensions to known massive sulphide positions and potential discovery of new deposits. Areas of current focus include Currawang, Cullarin, Kangiara and Peelwood.